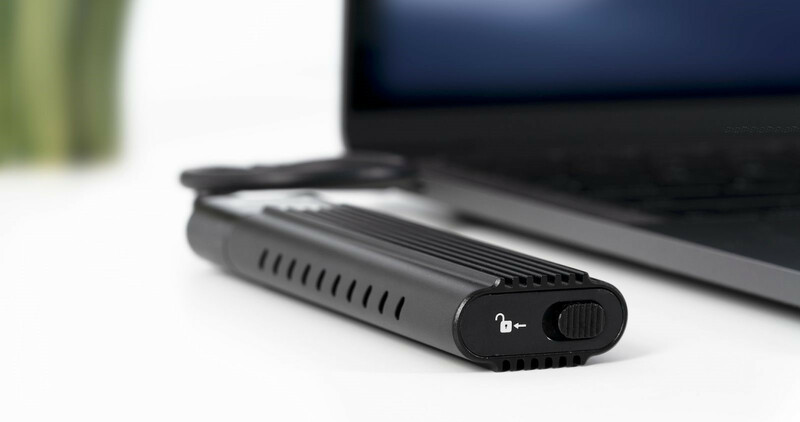 Unlike other NVMe enclosures that need screwdrivers to secure the SSD in place, the Plugable USB-C NVMe Enclosure enables opening the enclosure using a slide-lock, then gently aligning the NVMe notch into the socket and securing it in place with a tensioned rubber peg. Once the SSD is secured, users slide the cover back into place and it's ready for use. Thanks to the USB-C NVMe Enclosure's rugged and durable frame, it can be thrown into a bag and transported to different workstations without damaging the SSD inside. The Plugable USB-C NVMe Enclosure's aluminum body allows for peak heat dissipation compared to other solutions available on the market, thanks to its ideal thermal properties. By dissipating heat while in-use, the USBC-NVMe allows SSDs to maintain high-speed transfers (up to 10Gbps) possible with the latest USB 3.1 Gen2 technology. For example, a transfer of 1,000 8MB photos, which can take up to 40 minutes using traditional thumb drives, will only take 4 minutes using the USB-C NVMe populated with fast media such as the Samsung 960 EVO. Heat dissipation also extends SSD longevity, reducing the need for continuous replacement and data migration. In order to meet the needs of professionals with diverse hardware preferences, the included USB-C and USB-C to USB-A cables allow the USB-C NVMe Enclosure to be connected to any Windows, macOS or Linux device. It is also compatible with all M.2 NVMe SSDs from manufacturers like Intel, Phison and Samsung. The Plugable USB-C NVMe USB 3.1 Gen 2 NVMe Enclosure is available now for $49.95 on Amazon. lets put one of the most fragile storing equipment in a case. one drop and it is gone. get real, stick a 7mm 500gb ssd into your wallet. 50 dollars for a f**king NVMe case? They must be aiming this at Apple users. What? An NVMe drive is no more fragile than a traditional SSD. Indeed, particularly when mounted into a case with proper support on both sides. Sure, the m.2 PCB is thinner (and thus slightly more fragile), but the on-board components are the same except for the connector, and if anything, SATA connectors are incredibly fragile (they're rated for 50(!!!!) insertion-removal cycles!). m.2 PCIe connectors are far more durable simply due to being made from more durable material (fiberglass and copper > plastic). One might also argue that m.2 drives being smaller and lighter makes them more durable, as they'll carry less energy hitting the ground when dropped from the same height, requiring less protection from a case. I wish there were more pictures of this, as it looks tempting even if the price is about 2x what it ought to be (btw, Plugable's site lists this as a $69 MSRP, so the Amazon price seems quite low compared to that). Considering that the MyDigitalSSD M2X launched at $40, I'm guessing those NVMe-to-USB chips are rather expensive. No wonder, really, given the performance and how new these solutions are. You really think SSD is more fragile than HDD? Also, have you ever heard about flash memory cards? This case + NVMe drive will still be cheaper than a comparable mobile SSD. And these things sell like hot cakes. So maybe it's actually NOT for Apple users? Moreover, an external case like this one is actually quite a nice way to use your old NVMe drive after upgrading. And possibly the only way for notebook/SFF owners. The current ones are $40-70... either super low volumes... or that nvme-usb bridge chip is expensive... or a bit of both. Yep, I'm looking at that issue down the line when I finally give in and replace my current boot drive (which, admittedly, will be a while still). While there are ITX AM4 motherboards out there with dual m.2 slots, a motherboard upgrade to add an SSD seems like overkill - I'd rather spend $50 on an enclosure like this than $200 on a new motherboard.